Joy in the Morning–Who Brings It? WANT TO WIN A FREE SKYPE VISIT FROM ME FOR YOUR SCHOOL? 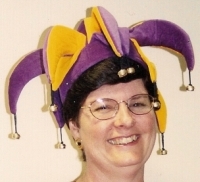 Carol Baldwin's Blog Carol Baldwin is an author and presenter of writing workshop curriculum. She is currently writing a middle grade historical novel. Catch of the Day Gretchen Griffith records stories about Pilot Mountain Schoolhouse during the 1940s-1960s. From the Mixed-up Files Middle grade authors post book reviews, interviews, and have giveaways. ReaderKidZ ReaderKidsZ posts book reviews for kids by themes. Authors are interviewed also. The 3 R's–Reading, 'Riting, & Research Joyce Hostetter shares her experiences as an author and reviews middle grade and young adult historical fiction. Copyright © 2016 Linda Martin Andersen. from Linda Martin Andersen is strictly prohibited. Three feet is often stated as the distance most people prefer to stand from someone else. This distance is called “personal space.” Name ways you reflect Christian love while standing at a distance and talking to someone. One example: smile. I try to reflect Christian love when I speak with someone. I know I’m not perfect, so I’m sure my posture and mannerisms do not always seem as warm and friendly as they should. I will strive to do better. Another example of a personal space that can reflect Christian love could be your bedroom, your car, etc. One personal space in my home is the sunporch where I often read and study God’s word. After this room was remodeled, I had two blank walls to decorate. I selected a Christian theme for this personal space. Photos below reveals that one wall is decorated with bird items and the other with flowers. Why? Jesus teaches that God cares for the birds of the air and the lilies of the field and he also cares for us. Scripture: Matthew 6: 25-34. By choosing to decorate my sunporch with this theme, my personal space reflects Christian love. I enjoy spending time in this space. Discuss personal space and Christian love with your parents! Perhaps you can work on a Christian themed decorating project as a family. How does a personal space in your home or car reflect Christian love? What could you write or draw to display to reflect your Christian love? What scripture passage(s) would you like to use to reflect a Christian theme? Name a family project that could reflect a Christian theme in your home. Thank you for visiting “A Writer’s Playground.” Come again soon and bring a friend. Please leave a comment. Remember that children 13 and under need an adult to comment for them. For more fun, sign up to follow my blog. Thank you! This entry was posted on June 26, 2017 at 8:21 am	and is filed under Activities for teachers and parents, Character Traits, Family Discussions, Homeschool Activities, Posters, remodeling, Uncategorized, Writing, Writing Prompts. Tagged: A Writer's Playground, blank walls, Christian love, Christian space, Linda Martin Andersen, mannerisms, personal space, posture, writing prompts. You can follow any responses to this entry through the RSS 2.0 feed. You can leave a response, or trackback from your own site. Thank you for this important food for thought! Steve, I’m glad you considered this topic food for thought. Thank you for letting me know. I love the Kristin Armstrong quote you displayed. Jinnette, thanks for the compliment. Very sweet! I appreciate that you commented and made my day! I’m glad you enjoyed the topic I chose. God planted this idea; so I thank Him. Thanks for saying I’m an inspiration and that I send acceptance and love. So sweet!. You are a dear friend! Your space is lovely, Linda. My sun porch is a little more chaotic than yours! But I do try to surround myself with scripture and beauty in my work space “office,” and throughout my home. I think beauty is an expression of our creativity and God’s nature. Blessings! Jean, thanks for the compliment. I’m glad you have a sunporch also. I’m sure it’s lovely. I like your definition of beauty–a combination of our creativity and God’s nature. I praise God that I know you! Kathy, I think most Christians have objects displayed in their homes that reflect Christian love. I enjoyed cecorating my walls with a Christian theme, especially one that reminded me of how much God loves and cares for me. I am glad my smile reflects my Christian love and it is contagious! Thanks for being my friend! That keeps me smiling through good times as well as tough ones. Tracy, It’s always a pleasure to hear from you. I would expect to find reflections of Christian love in your home. Thanks for the decorating compliment. I take that as a big compliment coming from you, my artist and decorator friend. I’m glad you give out hugs. I’m fortunate to have received many cyber space ones. Wonder how much personal space that is considered to be? LOL! Thanks for sharing these lovely pictures of your personal space. Nicely done! Thank you, Carol. I had fun decorating! I know you are enjoying decorating your new home too. I am glad to connect with you. I hope you are well. When I approach or speak or write to someone, I try to consider his/her viewpoint. What is this person going through? How can I show compassion? This is how I approach someone’s emotional space. Janis, you have shared some great tips on respecting emotional space. Thank you! Your comments remind me of the expression about walking in someone else’s shoes. You have such great insights to share! Thank you. We all have to develop our compassion.